The luxurious taste of caviar has been a part of Jordan hospitality for decades. Our connection to this culinary delicacy reaches new heights with the creation of the Jordan Chef’s Reserve Caviar by Tsar Nicoulai. 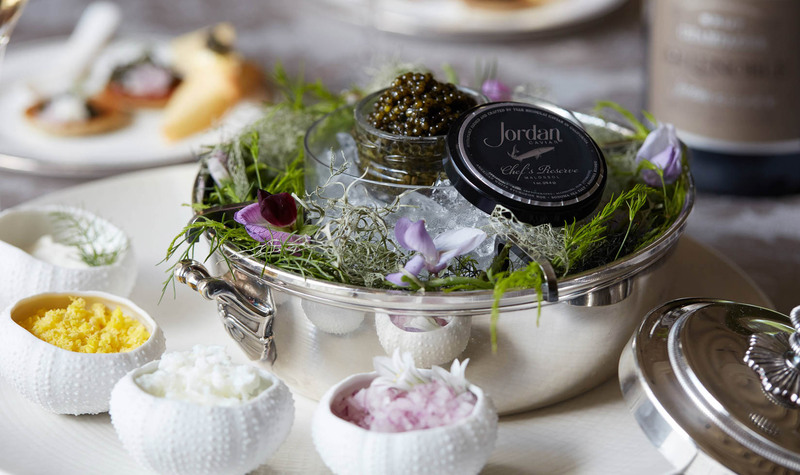 The Jordan Chef’s Reserve Caviar is only available to purchase directly from the winery with special shipping information. Hand-crafted and farm-raised in Northern California, this California white sturgeon caviar combines Tsar Nicolaui’s sustainable methods of high-quality farming and curing with a special salt blend created and applied by Jordan Executive Chef Todd Knoll. The result is a rich, elegant caviar that pairs beautifully with Jordan Chardonnay and Cabernet Sauvignon, and of course, Champagne. Experience this product with our Champagne & Caviar Tasting. For more than 30 years, Tsar Nicoulai has pioneered the sustainable movement of farm-to-table caviar in Northern California. Tsar Nicoulai uses only 100% California white sturgeon in the production of its sustainably cultivated caviar, creating an artisanal product that is natural, fresh and additive-free. Like Jordan, the boutique caviar house believes attention to detail, devotion to small producers and commitment to sustainable stewardship of farms are essential for producing a premium product. Crafted in collaboration with Jordan’s chef, this small-batch caviar is raised at the Tsar Nicoulai farm near Sacramento, just two hours from the winery. To create this new caviar, Executive Chef Todd Knoll harvests salt water and kombu from the Sonoma Coast, dehydrates the kombu and then lets it infuse with a chilled bath of the collected salt water for three days before the kombu is removed and final evaporation occurs, making the caviar’s essential cure. Eggs are sustainably harvested from California white sturgeon that have lived at the farm for 8-10 years before the chef applies the salt blend and lets the caviar cure for eight weeks. As with all Tsar Nicoulai products, this caviar was carefully produced and selected without the use of antibiotics, growth hormones, GMOs or synthetic preservatives, creating a caviar of the highest quality and integrity for your enjoyment. Less is more with this grand-sized nutty caviar. Keep food pairings simple to allow the subtle properties of the caviar to shine. Serve atop buckwheat blinis with crème fraîche and diced egg, spoon over small roasted fingerling potatoes with crème fraîche and chopped chives or add a quenelle atop seared diver scallops. This umami-rich caviar makes for an indulgent garnish for many of our chef’s recipes. To preserve best flavor and texture, place in a bowl of ice in the coolest part of your refrigerator (usually the back) and refresh ice once a day. 60 days (1-ounce jar). Once opened, caviar should be consumed within one day.